Super Bowl Sunday is just 3 short days away! 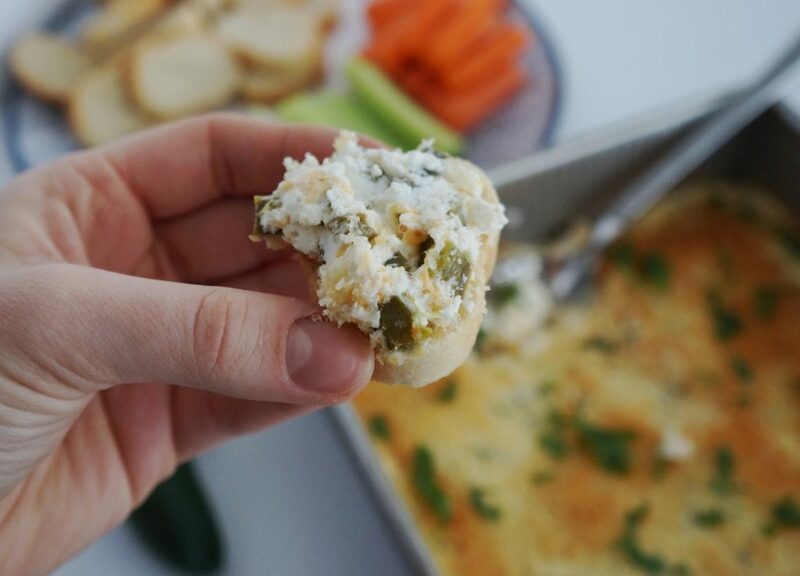 If you’re headed to a party or hosting one of your own, this Lightened-Up Jalapeno Popper Dip should definitely be on your menu! When it comes to party snacks, I’m all about the dips. Hummus, guacamole, salsa, onion dip, spinach dip… you name it, I love it. 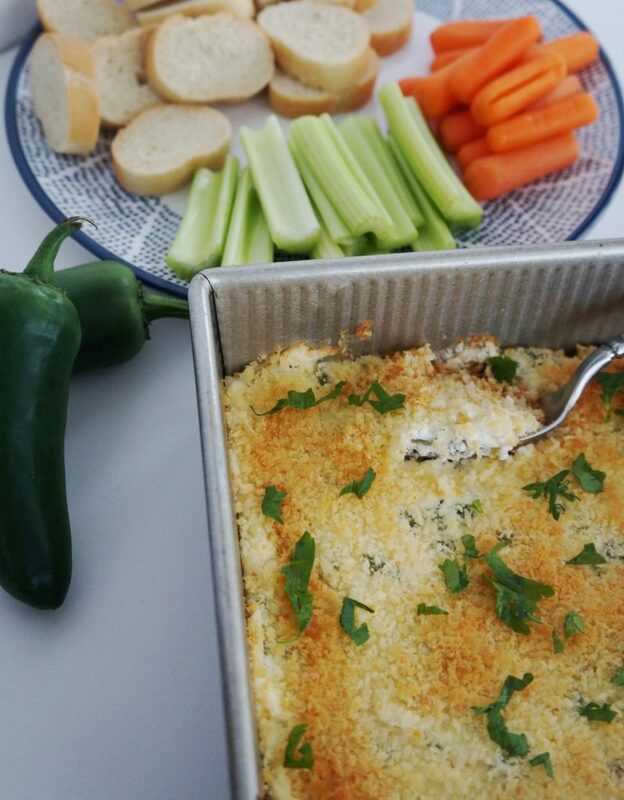 One of my absolute favorite dips is Jalapeno Popper Dip. I can’t resist the spicy jalapenos and creamy, melty cheese. That being said, it’s usually super unhealthy. Most of the recipes out there contain come combination of mayonnaise, full fat cream cheese, butter, and a TON of cheese. Not very diet friendly, even if you use veggies as your dippers (but let’s be honest- most of the time people serve it with bread or crackers). I lightened up my version by using plain Greek yogurt, reduced fat cream cheese, no butter or oil, and a lot less cheese. With those modifications, this dip is A LOT better for you than traditional versions, but it still packs a TON of flavor. It doesn’t loose that spicy and cheesy flavor I crave or the creamy texture I love. No one will even know it’s a lighter dip. I like to serve it with celery, carrots, and bread. The bread is always the most popular dipper, but my favorite is the celery. 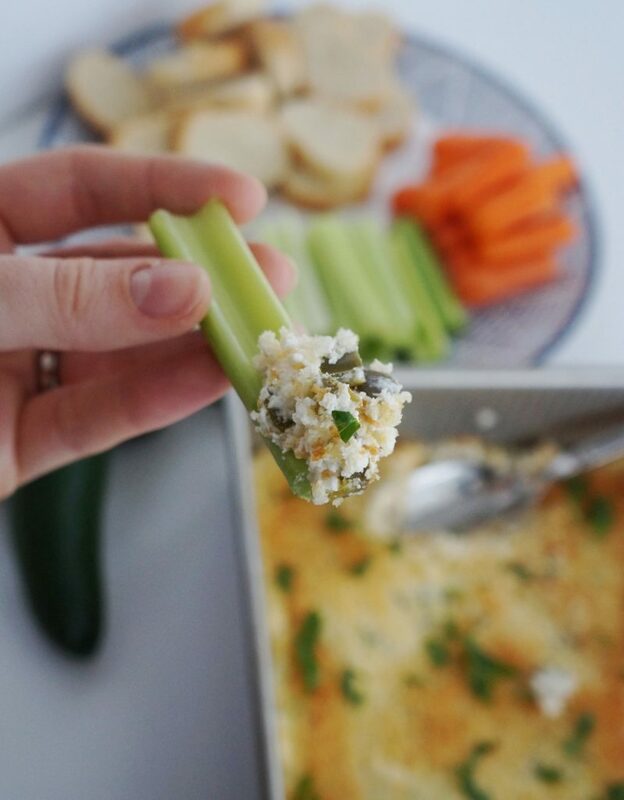 This dip would make a great addition to your Super Bowl spread! If you try it- let me know what you think by leaving a comment. *I highly suggest tasting your jalapenos after roasting. The heat can vary and sometimes if they are very mild you may want to add more than 6, or if they are very spicy you may prefer less. Preheat broiler on high. Slice jalapenos in half lengthwise and remove seeds and membranes. Place cut-side down on a foil-lined baking pan. Broil on high about 4 inches from the flame for 3-4 minutes. Watch them carefully. The skins should turn black and begin to peel off. Remove from the broiler and set aside to cool. Off the broiler and preheat oven to 350 degrees F.
In a mixing bowl, beat together the reduced fat cream cheese, Greek yogurt, onion powder, garlic powder, paprika, salt and pepper until smooth and creamy. Stir in 1/4 cup of the Parmesan and all of the cheddar. Set aside. Once cooled, finely dice the jalapeno and add to the cream cheese mixture. Mix until well-combined. Spread into a 8×8 inch baking pan. Top with remaining Parmesan and panko breadcrumbs. Bake in preheated oven 25-30 minutes or until breadcrumbs are beginning to brown. 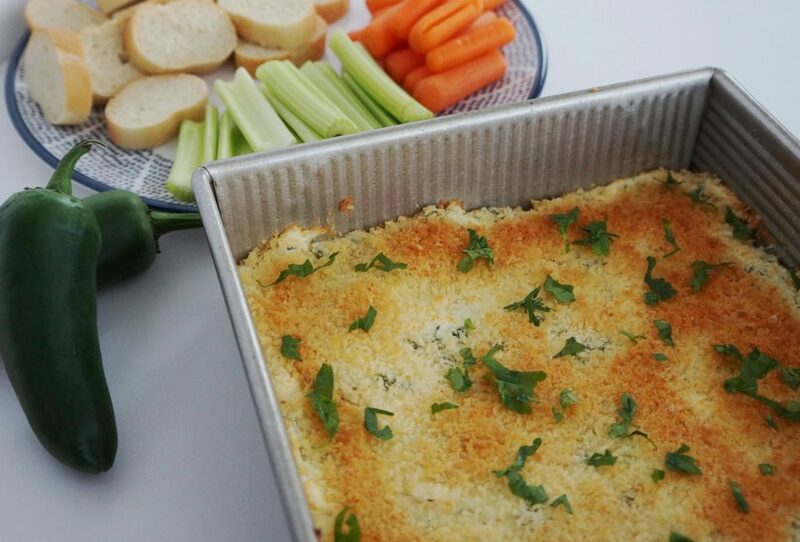 I like to broil the dip for 1 minute before removing from the oven to make the breadcrumbs darker. Top with fresh parsley. Serve with raw vegetables, bread, and/or crackers. Jalapeno Popper Dip keeps well in an air-tight container in the refrigerator for up to four days.